I’m running a bit late this morning, sorry! And in the run-up to Christmas, things are starting to mount up… are we jumping up and down on the spot yet?! So at that time, the kids and I had come back from the States and were trying to make a go of it in the UK. I was pretty much starting from scratch with Clarity, having already built it all up in America, only to have to fold it into a suitcase and come back to Britain. But there you go! Part of Life’s rich tapestry! I think I told you, I had a stand up at the Sava Centre in Hempstead Valley, outside Marks & Spencers, where I use to stall out every Sunday? Look! I found some photos! You can see, in those days, I was very focussed on the product. Whereas nowadays we display beautiful samples of what you can do with our stamps, in those days, I simply stamped out the images, so that folks could see what they looked like. We didn’t have clever racks to display the stamps either. It really was a table-top affair! The stamps still look the same though, eh. I learned so much doing that every Sunday! There was a book-binder, a nice old chap, who used to sell his things next to me. He would talk and explain to customers all day long.…I’ve made all these things for you myself. This is all handmade. Do have a closer look. ” and on and on and on. He even talked when there was nobody there, which was quite often! One day, I said to him, “There’s nobody here! Who are you talking to?” And he told me something invaluable, which I would like to share with you. “Ah but you see, Barbara, it’s never the person you are talking to that counts. It’s the one listening.” I understand that now. Behind me there was a Silk flower stall. Mandy and Roger made those. 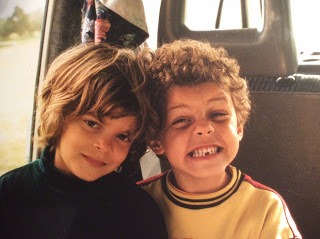 We became good friends. I learned a lot from them about display. They were always so busy! But the way they displayed their wares was delightful! Before the public came in and we were setting up, Roger would go at it like a beaver with trellis-work and shelving. Then Mandy would tell him to get a move on! Then he would tell her he couldn’t go any faster and to back off! She would roll her eyes, and so it would go on. We used to have such a laugh. But the prep they put into the display and the prep they put into the product paid dividends. Every single Sunday. 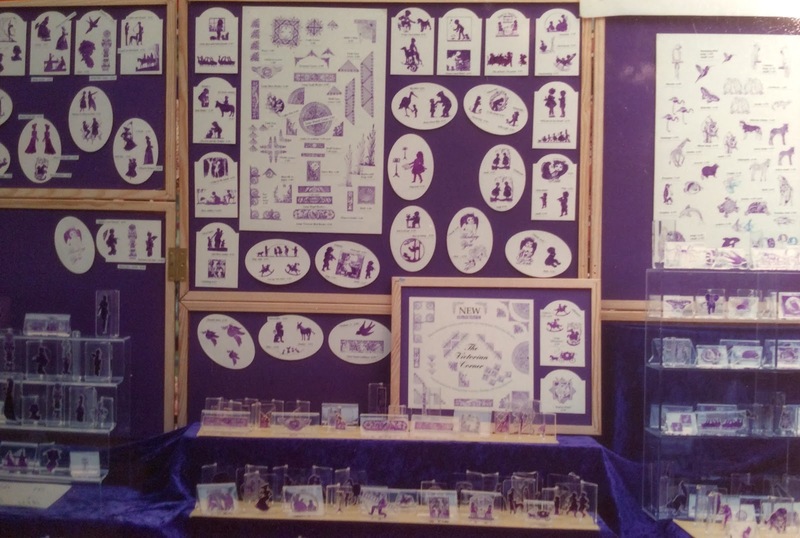 One of my regular customers, who also became a good friend, Ken, suggested that we might do the big stamp show in London. This was news to me! 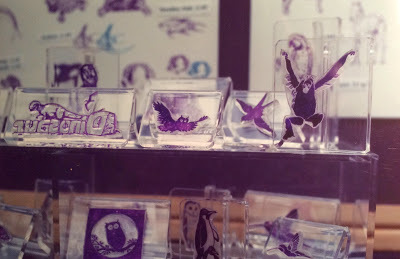 A stamp show? In London? Well, in those days, before the internet, information wasn’t that available. So Ken gave me the details, I applied, and we booked a stand for the September. It was at the Commonwealth Institute in Kensington. We spent many weeks preparing. I remember it so well! The set-up was on Saturday afternoon, so we packed our new Camper-van to the gunnels, and set off for London. It was a big deal for us! I think there were about 6 of us! The plan was to build the stand, get it all ready with shelving and display units, and then load it with stamps. So we built our shop. It was a bit dark in the hall, so we were thinking we should have thought of lighting. “Not to worry! We can bring the bedside lamps”. We were commuting, obviously. As long as I live, I will never forget what happened next. Yep. We had left the stamps at home, on the breakfast bar. At this juncture, in case you hadn’t figured it out, there are 2 things worth pointing out: firstly, our entire stock fitted into a single box, and secondly, the box was small enough to sit quite comfortably on the breakfast bar. I remember the next day though, the first Stamp show day. 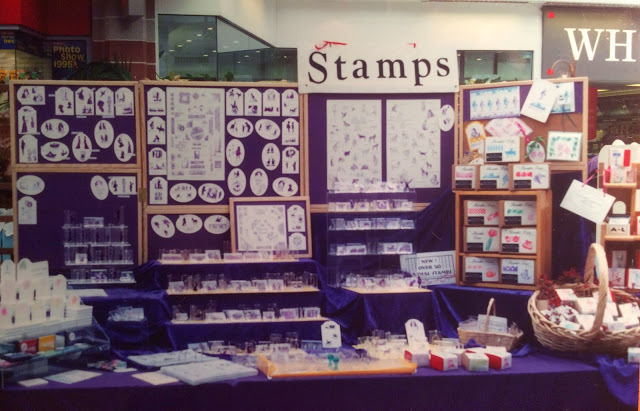 I remember the crowds and the excitement at our lovely transparent stamps. We were the only company making see-through stamps, so we were revolutionary! The customers were 3 deep! We sold out so quickly! (Well, you would if you only had a box of stock!). After all those humbling months at the Sava-centre, being ignored by throngs of people headed for Marks & Sparks, here was our target audience, all together in one room!!!! The learning curve that day was phenomenal. 4. Oh, and remember to pack the product! I think Tuesday is my favourite blog day! I love hearing how you've got to where you are. Thanks for sharing. Have a great day! That is such a great story. And when you know how it goes now at the NEC for example…..long way gone. Love the sentence of your "neighbour", it is so true. Thanks for sharing another lovely part of your life. I really enjoy delving into the life of Barbara Gray! Look forward to Tuesday as it really gives an insight of how you have got to where you are today- hope that makes sense! 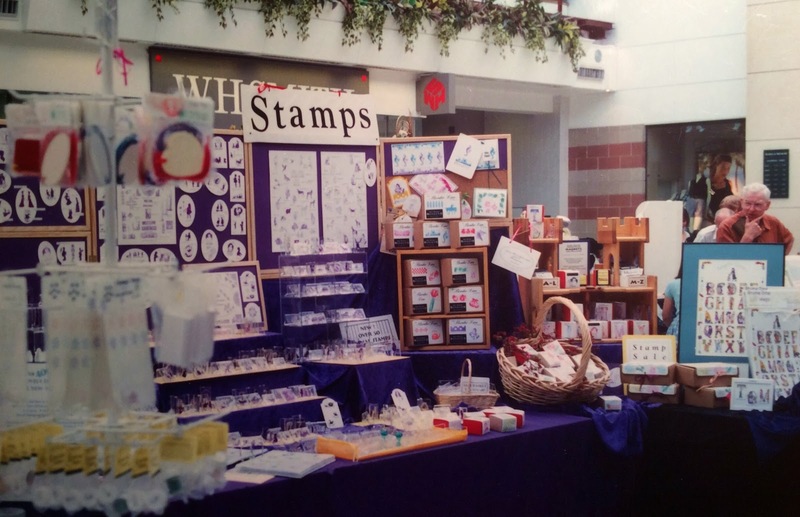 I have had a real chuckle today at the thought of you arriving to sell stamps but without any stamps to sell! I could've done that lol. Thanks for the insight! Great story, I love the walks down memory lane. Thanks for sharing. Hi Barbara, do 'I Spy' a dinosaur stamp in your last picture? I really need one of these, is there any chance you might produce this one again? Remembering the people you meet on the way up is important! These are the ones who make your tapestry rich! Love reading the blog Barb, and seeing your determination, and how it paid off! So glad you found the 'stamp show'! and the rest they say is history!!!!! Beautiful Product, Fantastic Presentations and Wonderful PERSON!! Fab story – we take for granted the range of info that we can access since the internet – glad you got to your first stamp show (even if you forgot your stock!). Sue just like to tell you that I love hearing how your life has gone and its so interesting. Sounds like the kind of thing I would do,memory is getting worse as the years go by. PS Got one photo sorted, just need to be able to do it at will and for myself. I love reading your blog on a Tuesday. Great way to start the day. You are so full of inspiration. So generous with your time. Like all the others I am so glad you had a dream and followed it. Love hearing about how you got where you are now. You must be very organised if you can find the photos from so long ago! Keep it up. Thanks for Sharing your story, it is very interesting. You have certainly come a long way. I bet you never imagined back then that you would have a hugely successful company now and all of us devoted fans . Many congratulations and Merry Christmas. I love the Tuesday blog and the great insight in to the world of Clarity. It is great to hear that you still remember those people from the early days of Clarity who gave you some sound business advice which you still live by each day and that you learn by your mistakes. Can't wait to see what is in the next instalment and hope your meeting goes well! Especially if they are not over-stocked eh!!! Oh, dear, a hard lesson to learn. I bet you haven't forgotten anything lately. It's been an amazing journey and one I am enjoying reading about. May you continue to reap the rewards. You deserve it. Wonderful Barb. I love reading how Clarity started. I cannot imagine you only having one box of stock! Somethings never change though do they – your stand is always a minimum of 3 deep!!! Loving the lessons, a brilliant insight into how you've achieved what you have. Love the owl is that still available? Tuesday, my favourite day. It seems to me that things don't really change much, instead of the forgetting the stock now you sell out. Every time we have been at the NEC Dave has had to drive home over night because the stock has sold out, sometimes after the first day. The story is a lovely read and the pics of the children are lovely. A lovely read again Barb and it brings to mind a song from The Sound of Music….you know the one…. Hahaha! I was thinking , "the hills are alive?" I have 2 comments. 1. I liked what you said about the chap at your stall about listening, we have two ears and one mouth – now we know why! Secondly, do you have a mask mantra? All I can remember is "if you want the image in front, stamp it first" I get myself in a right horlicks with moons, how do YOU remember which order they go in? I look forward to reading your thoughts every day, thank you so much for the constant inspiration. Merry Christmas to you and your lovely fella! Hi Barbara, well I must say Tuesdays are my best days for reading your blogs, it's so interesting to learn all of the trails that you went though to get people to notice your stamps.